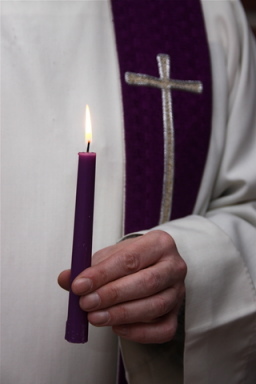 Pastor with candle (© Ole Jakob Ihlebæk| Dreamstime.com). When the 5.5 million member Evangelical Lutheran Church in America voted to lift its ban on gay clergy at its late August convention, many observers were reminded of the controversy surrounding the 2003 decision of the Episcopal Church to consecrate a homosexual bishop and the ensuing split this caused between the global Anglican communion and the American denomination. Because of the more autonomous nature of Lutheran churches, the recent decision is less likely to cause a crisis in global Lutheranism than was the case with the Anglicans. Yet the new stance of the ELCA along with that of other Lutheran bodies in Europe supporting gay rights in the church is increasingly clashing with the traditional positions of Lutheran churches in Africa, Latin America and Asia. The ELCA decision concluded a long struggle in the denomination over the contentious issue. The delegates voted by 559-451 to approve a measure allowing “publicly accountable, lifelong, monogamous, same-gender relationships” to serve as official ministers. Another measure was also passed to find ways to support gays and their relationships in ELCA congregations. Presiding Bishop Mark Hanson and the documents themselves stress that no congregation, clergy or members are required to accept gay clergy. A clause was added to the passed measure to find a way to give space in the denomination to those opposing the measure, though it was not specified what this may mean. Although Hanson has repeatedly called for unity and continued dialogue in the church, it is obvious that there will be congregations and individual members leaving the ELCA over the decision. Right after the measure past, several clergy and members announced their decision to leave the body. In the week after the event, churches have declared themselves to be out of communion with the denomination. Ethnic congregations—mostly black, Hispanic and Asian—were strong in their opposition to this change and several observers have predicted that they may be among the first to leave. A September meeting organized by one of the main opponents to the measure, LutheranCORE, will draw many of the dissenters to deliberate about their next course of action. One proposal is to create a non-geographical synod (or diocese) for traditionalist churches. Since such an arrangement will require a vote by the denomination, this may prove difficult to achieve. Departing congregations may join one of the newly created conservative bodies, such as Lutheran Congregations in Mission for Christ. There may not be the protracted battles over property as in the Episcopal Church, since the ELCA allows departing congregations to leave with their buildings if they can get a two-third vote from their members to do so. However, in polarized congregations, dissenters may face legal and denominational battles. The national and international repercussions of the ELCA decision will also likely unfold in the months ahead. Because of the moderate reputation of the ELCA among mainline Protestant churches, the recent decision may push other liberal denominations, such as the United Methodist Church and the Presbyterian Church (USA) (which have narrowly defeated gay rights measures of their own) to press further on such issues. There is some speculation that the church’s involvement with dialogues and other forms of cooperation with Roman Catholics and Eastern Orthodox may be affected by the decision. Since Hanson is also president of the Lutheran World Federation, based in Geneva, his church’s decision will have added significance and controversy. In the weeks leading up to the ELCA’s decision, several LWF member bodies from Eastern Europe, Africa and Asia wrote pleading with the American church not to take such a position. The ELCA joins other Lutheran churches in Europe that ordain gays and bless homosexual unions, such as the Church of Sweden and the Church of Denmark. A lesbian was recently elected as the bishop of Stockholm in the Church of Sweden. Such liberal changes (including ordination of women) in these churches have led traditionalists to establish ties with conservative Lutherans in the global South. For instance, in 2003, Kenya’s senior Lutheran Bishop Walther Obare agreed to oversee a non-geographical diocese of dissenting traditionalists in the Church of Sweden, though he was expelled from the Lutheran World Federation for such an action.